Forthcoming events – please join us, everyone very welcome! Speaker: Claire Moores from Cheshire History. ‘How to read a Landscape’, analysing features to reveal a place’s history. All winter meetings are held in the Community Centre, Ovenhouse Lane, Bollington at 7.30pm. Everyone is welcome to all our meetings – a small contribution is asked of non-members. Finding it – Ovenhouse Lane is off Henshall Road and the Community Centre is the last building on the left at the far end. Plenty of parking including in the sport field car park. The Community Centre is almost next door to the Leisure Centre. Map . We provide a line up of interesting meetings for you to participate in and enjoy! Everyone is welcome to attend Civic Society meetings including non-members who will be asked to make a small voluntary contribution. This is redeemable against a subscription if you join on the night. All members with email addresses are sent a reminder a few days before each meeting. If you would also like a reminder please send an email now and we will send you a memory jogger too. 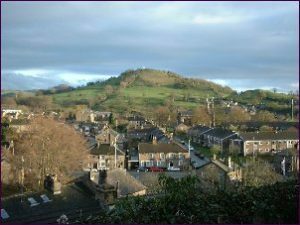 The Society holds monthly meetings from September to May (but not in December) each year to provide maximum opportunities to discuss matters of direct concern to Bollington. If there is a particular subject you would like considered at a future meeting then please email the committee. plus Cheshire East’s latest plans for housing in the Green Belt. Next meeting will be the start of the Autumn season on Monday 16th September. Bollington Civic Society meets indoors on the third Monday from September to May (but not December) each year. All our meetings are open to non-members. Additional meetings, usually outdoor, are arranged for summer evenings and weekends. A sub-committee chaired by Graham Barrow is responsible to the main committee for the management of the Discovery Centre . Bollington Civic Society supports Civic Voice! Bollington Civic Society is a member of Civic Voice , which has the support of Restoration presenter Griff Rhys Jones to represent the interests of civic societies across the country to government, national bodies and local councils. This body has been successful in raising the profile of civic societies and the work that these bands of concerned volunteers do, and has gained a position of influence so that the concerns of civic minded groups like ours get a better hearing from government, local councils and authorities in general. Our conservation areas, in particular, are under threat from inappropriate developments, householder ‘improvements’ and the general clutter of modern life such as too many road signs, yellow lines and so on. It is important to have a national body that can raise awareness where it matters to get more consideration for the community built into public decision making and to raise the public’s awareness of what they, the community, are at risk of losing. Ian Harvey, who, with Anthony Burton, founded Civic Voice in 2011, gave an outstanding presentation to Bollington Civic Society on the subject of Consevation Areas. He welcomed the action Bollington Civic Society has already, and continues to take to provide protection to our outstanding heritage buildings. Our MP, David Rutley (on left in picture) was an inaugural member of the All Party Parliamentary Group (APPG) for Civic Societies. 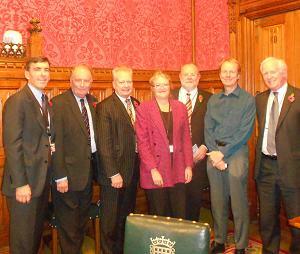 This group was instigated by Civic Voice’s very active director, Tony Burton (second from right) to ensure that there is a body of MPs at Westminster who are fully briefed on civic matters and who will be able to lead debates on civic matters and ensure that Commons doesn’t ignore the interests of the civic community. The Civic Society supported the development of the two Town Plans in 2004 and 2008. The Government have since brought in a scheme to get every neighborhood to develop its own local plan and Bollington has done this by extending and revising the existing Town Plan. This activity had by law to be carried out independently of the Town Council (though individual councillors may still contribute) and the Civic Society was a participant to the project. The new Neighborhood Plan was put to a town referendum in 2018; it was accepted and has now been legally included into the Cheshire East Borough council Local Plan. The Civic Society were involved with the opposition to the proposed housing developments behind Lowerhouse mill. Unfortunately we were not successful and construction on the first site is underway. Please see the page devoted to this. The Civic Society was commissioned by Bollington Town Council to conduct a public consultation to determine what the community would like to happen to this very large redundant industrial site. Construction has been under way since 2014 and has been completed by mid 2018. See the page devoted to this. The land surrounded by Cumberland Drive, Lord Street, Chancery Lane and High Street. We strongly contested the original planning applications and the appeals made by H Cumberbirch & Son Ltd against the rejection of their plans to build on the Red Lion Inn car park at the top of High Street. Happily we won our case and their first appeal was rejected. They subsequently submitted a further application for four three story houses on Cumberland Drive. We contested this at planning committee and won our case again. Unfortunately we lost at the subsequent appeal. See the page on this. They consulted us about the site opposite the Red Lion. They subsequently submitted an application answering all of our main comments and we decided not to contest it. This was approved and has suffered a chequered construction history that continues during 2018; construction has stopped due to the bankruptcy of the developer. The site is up for sale wth the proviso that the present half-built properties must be demolished! A plan was put to the Church authorities by a local developer, Simply Group, and they agreed to sell on that basis. The Civic Society was concerned on a number of matters but since seeing the full plans and heard the developer’s intentions we withdrew our objections. The full plans were approved and development is supposed to be going ahead. However, nothing has happened for at least ten years, although the developer continues to assure us that they “… will be starting soon.”! A page is devoted to this. Bollington Tourism – Destination Bollington! There were concerns that tourism was not developing sufficiently well but that is now changing with the development outside the Civic Society (although members are involved) of the Destination Bollington project! Have a look at the page. The Civic Society, represented by Graham Barrow, were at the forefront of the campaign to construct the new footbridge over the canal at Clarence Mill to enable canal users on the towpath to access the mill, its businesses and facilities, particularly the café and our own Discovery Centre , and to enable those who live in and around the mill to access the towpath and the Recreation Ground for their recreational purposes. To break an impasse we even agreed to own the finished structure! The opening of the bridge at the end of August 2009 has resulted in very significant increases in the numbers of visitors to both the café and the Discovery Centre . We developed a Discovery Centre at Clarence Mill which opened on 14th May 2005. It is on the canal side at Clarence Mill by the great generosity of the owners Clarence Mill Properties Ltd. We obtained grants for its development from the Heritage Lottery Fund, Cheshire Rural Recovery, Macclesfield Borough Council, Bollington Town Council and other private donors. It provides information and exhibitions designed to show the past, present and future of Bollington, its industries and its people. Do pay us a visit, opening times on the web page. The Discovery Centre houses the very popular historic picture collection which contains over 5,000 pictures of Bollington and its people going back more than 140 years! This project began in the 1980s when the late Dr John Coope MBE urged his patients to get out their old family albums and lend him the pictures for copying. The collection was scanned into digital images as part of the Discovery Centre project in 2004/5 and we spent some years cataloguing the collection in order to make all the pictures available to the public in a structured manner. We continue to collect pictures and documents to be added to the collection. The database went online in 2009 and can be accessed at http://bollingtonphotos.co.uk/ . This project was established in late 2006 and did much good work over the years. In early 2013 the group decided they should merge with a Macclesfield group ‘go-lo’ who took over the re-development of the toilet block at the bottom of Shrigley Road, having been able to obtain the resources necessary to carry out the work. Unfortunately the government changed their mind about eco funding and withdrew the monies allocated to this project and so, regrettably, the group has now folded. We are taking a closer interest in the changes that take place in the four Conservation Areas (CA) in Bollington. These are described in full on separate pages. We were very pleased that Cllr Ken Edwards (Bollington Town Council) supported the society with the specific responsibility for Conservation Areas, and he continues this support now that he is chairman of the Civic Society. One of his primary interests is in establishing a further CA at Lowerhouse and discussions took place with the old Macclesfield BC and with Cheshire East Council, but obtained no support. However, in 2017 we are advised that CEC would support a change to Bollington Cross CA to add Lowerhouse to that CA, and talks are progressing to determine the exact area for protection. We have also discussed with the CEC Highway Authority their compliance with Conservation Area guidelines while maintaining our roads. We watch planning applications, discuss them with those having an interest and make representations to Councilors and CEC planners where we wish to challenge proposals. If you are concerned about a proposal and would like to discuss it with the Civic Society please email the chairman Ken Edwards. A group of historians and their helpers have assembled a very large collection of photographs showing Bollington and its population through the past 100+ years – our oldest picture dates from about 1860, before the railway was built! They continue to research the history of the town, its industries and the people who made it what it is today. The Discovery Centre provides public access to the collection for the first time. The collection is also now available online – go to the Discovery Centre pages. We have re-published two of the well known books about Bollington and further publications are planned. The Society was involved in the historical survey which formed an early part of this project. We are also acutely interested in what development takes place in the Vale. The KRIV project finished in summer 2010. KRIV Volunteers continue to maintain the area (see their blog ). The Civic Society originally founded Bollington Live! and has remained as a sponsor since it became independent. The village magazine is published three times each year and delivered free to every home. Several of our members are involved in the writing, editing, selling of advertising, and delivery of the magazine. The Civic Society seeks new projects that deserve the support to enable care and improvement to Bollington and its heritage. If you know of something that needs attention then please bring it to the notice of the chairman, Ken Edwards, now.